I have finally used my Makerbot Replicator 2 (not a 2x) enough to run into a problem that is not strictly end-user serviceable. 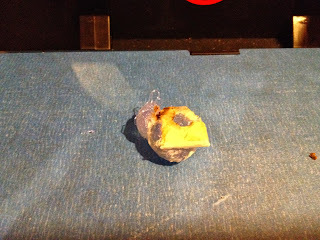 A large filament ball stuck to the ceramic insulation tape surrounding the Replicator's nozzle and ripped the tape when the ball was removed. 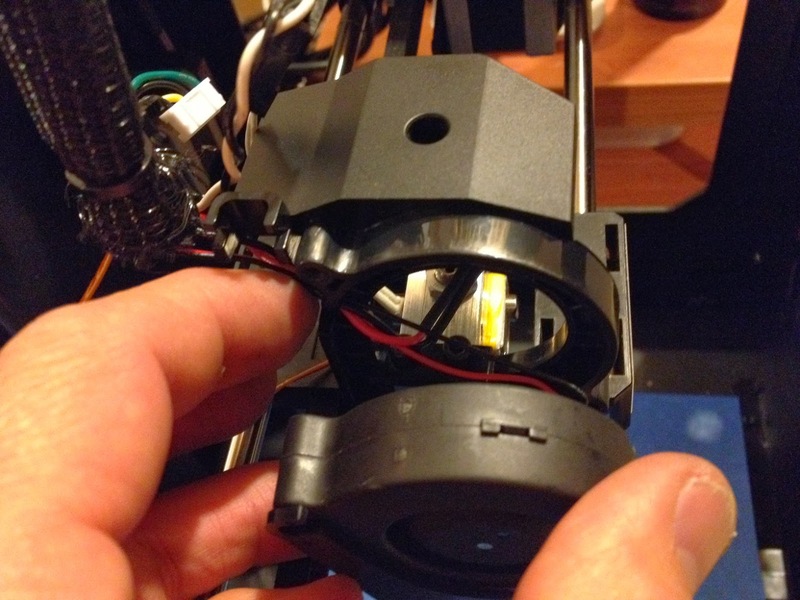 Makerbot does have a video on removing a filament ball (or "blob" as they call it - must be a technical term). Look for the video entitled "Removing a PLA Blob" on their troubleshooting page. They suggest heating the extruder nozzle and gently lifting off the ball while being "careful not to rip the ceramic insulation tape". Yes, indeed. I agree that it is always best not to remove a filament ball when the nozzle is cold, but the described process wasn't sufficient for me. 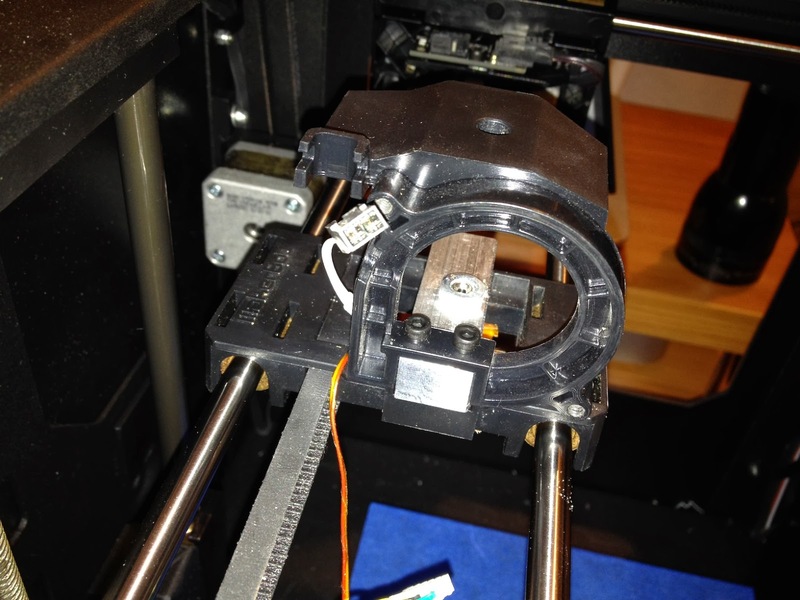 I have since discovered that I can use the "Load filament" option under the Utilities menu to heat the extruder and use newly applied filament to melt and gently force downward the ball. That seems to make it easier to remove cleanly. I decided to replace the ceramic insulation tape and the kapton tape that holds it in place. 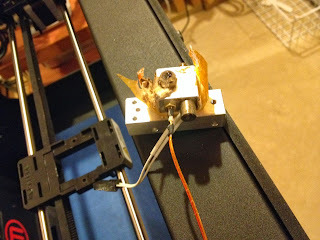 This required a rather complete tear-down of the extruder assembly, but it wasn't really that bad. Anyone reasonably careful should be able to do it themselves. I sourced some ceramic insulation tape and some kapton tape to cover it from UltiMachine, a RepRep printer supply company in Tennessee. Unfortunately, Makerbot doesn't supply such parts. 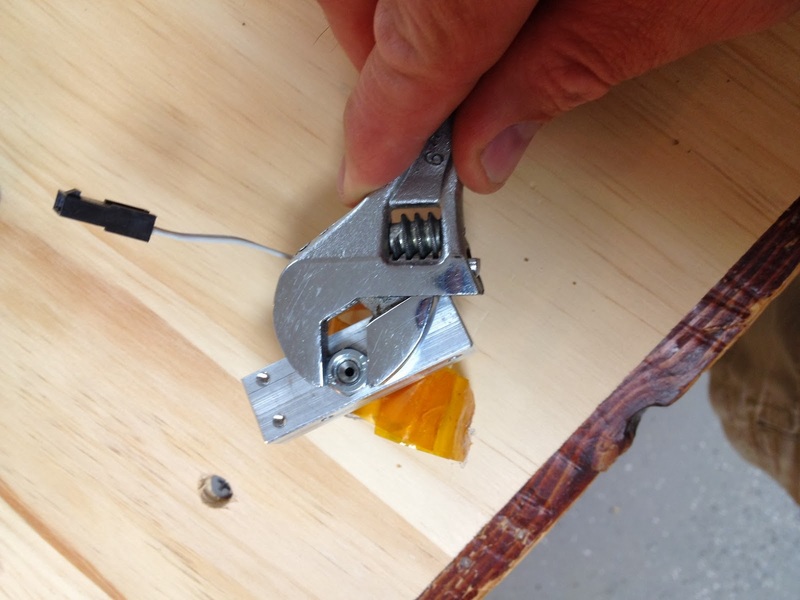 The kapton tape from UltiMachine was quite thin side-to-side, much thinner than the tape used by Makerbot. I used it anyway and just wrapped it around to ensure a complete coverage. It seems to be fine. The first thing to do is to carefully remove the fan assembly and extruder motor from your Makerbot Replicator 2. These instructions will help you if you are unfamiliar with the process. 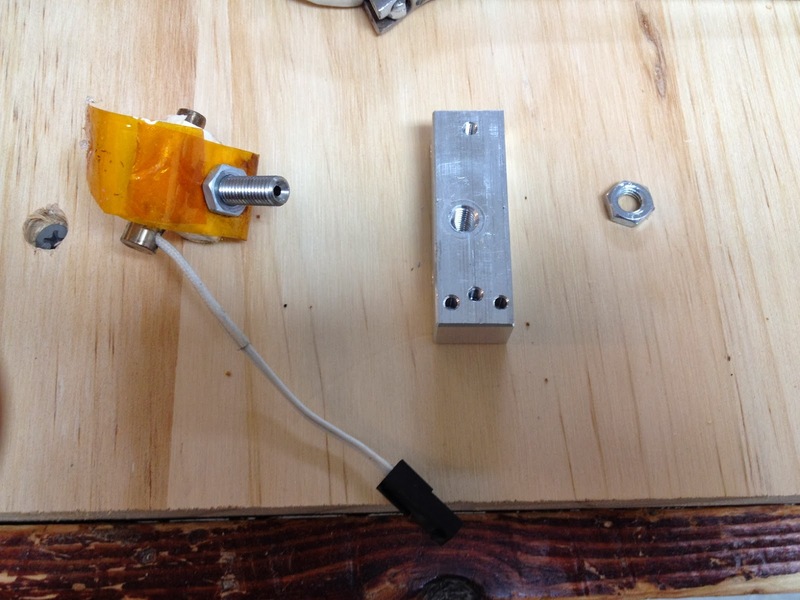 They were developed for the upgrade of the extruder assembly. Follow them just until you remove the fan assembly and the motor, but do not take off the extruder itself. Next you will need to remove the side fan assembly. Use a Phillips screwdriver to remove the two screws holding the assembly to its chassis (shown at 10 o'clock and four o'clock in the picture below). 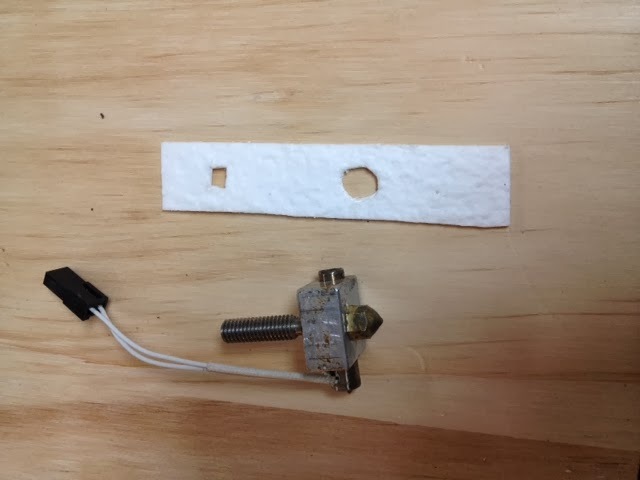 Disconnect the electrical wire connectors so the fan assembly hangs down out of your way. Note that you will still have two wires (in a single insulated cable) connected at this time. Those are the thermocouple wires that are used to heat the nozzle bock. They will be removed shortly. Remove the two hex screws from the base of the chassis that connect the chassis to the aluminum block beneath it. Removal of the chassis exposes the aluminum heat sink. The nozzle assembly is attached via a bolt and hangs beneath the heat sink. Removal of the aluminum heat sink requires you to look underneath the assembly to find two more hex screws, one on each side of the heat sink. 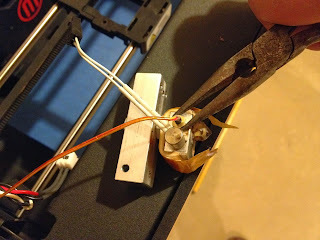 Now it is time to remove the thermocouple wires. Unscrew the thermocouple connector from the nozzle block. Note that the wires will twist if you leave the block in place! Instead, you should rotate the nozzle block to remove the thermocouple connector as soon as you loosen the connection enough to do so. That will keep the wires from breaking. 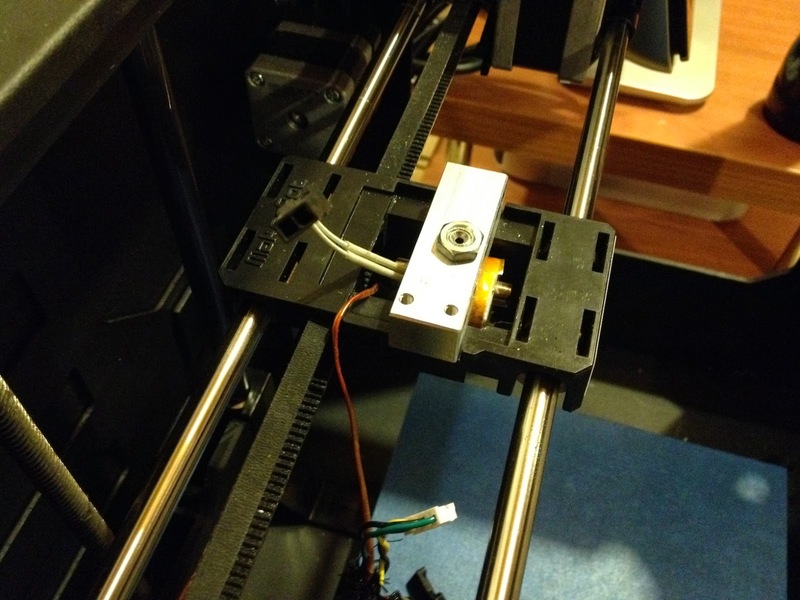 You should now have the nozzle block and heat sink completely removed from the printer. You can move it to a more convenient working surface, such as a workbench. Use a crescent wrench or socket wrench to remove the nut at the top of the heat sink, as shown. 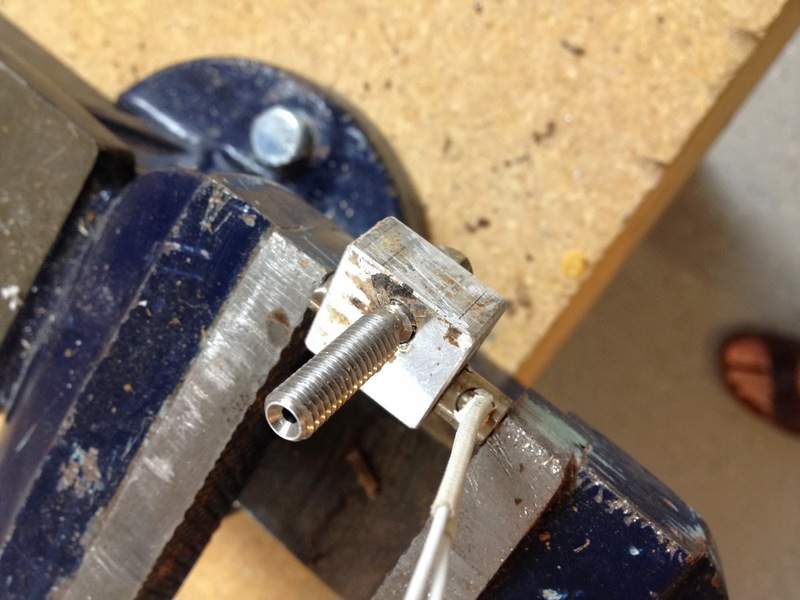 You will see that the bolt has a hole through its center; that is where the filament passes on its way to the nozzle. Remove the heat sink and set it aside. 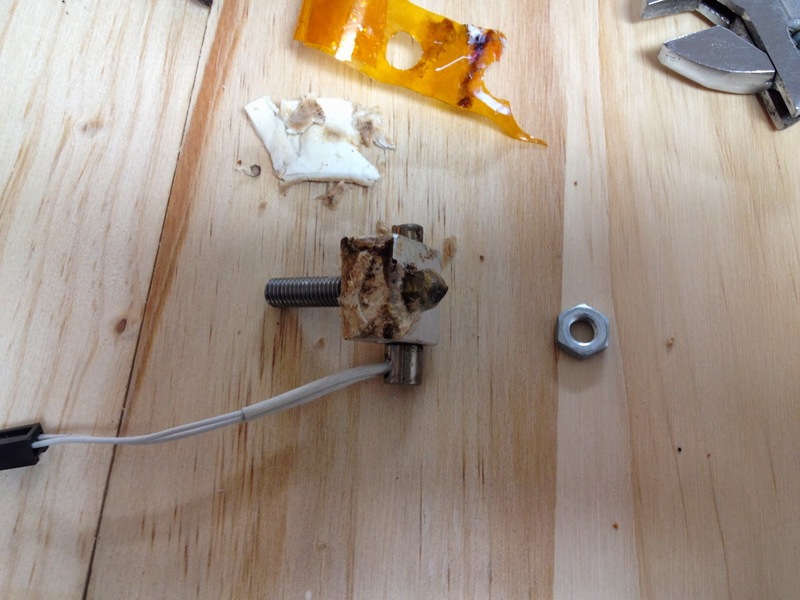 You should also remove the nut between the nozzle block and the heat sink. 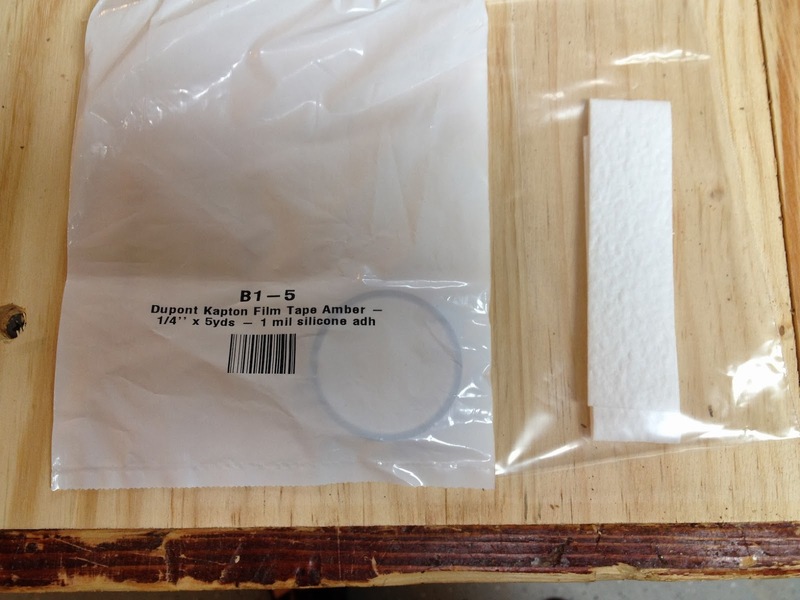 Clean off the old kapton tape and ceramic insulation tape. Some of mine was baked on and was difficult to remove. 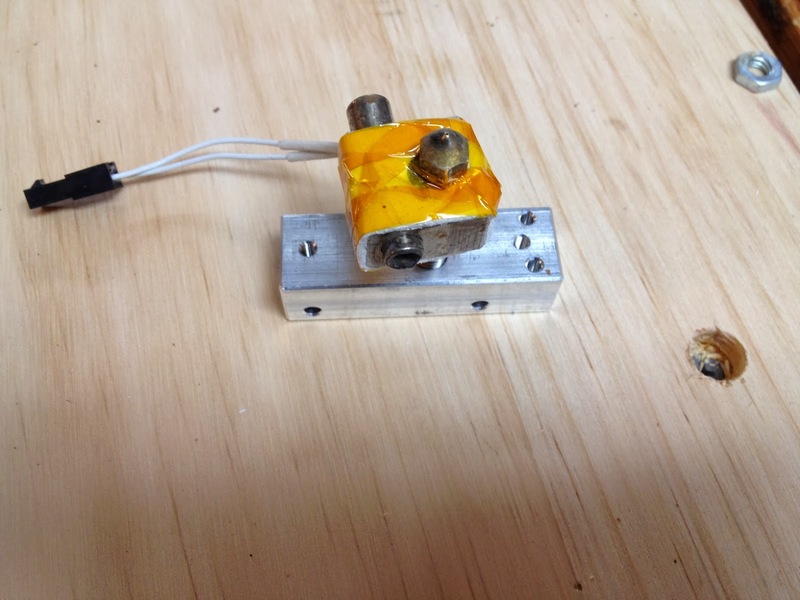 Carefully remove the tape so you don't damage the brass nozzle, the aluminum block or the wires. 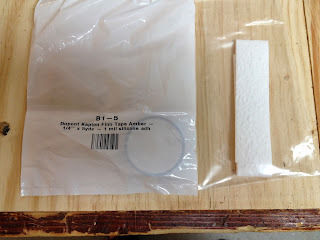 I used a utility knife to remove most of the material and found that heating the material with a portable butane touch made it easier to remove. Please note that a steel utility knife blade is substantially harder than the aluminum of the block or even the brass of the nozzle. You can shave off bits of them if you aren't careful. You only want to remove the old tape. I placed the block into a vise to facilitate cleaning it and also (carefully) used a wire brush for the final touches. Cut some ceramic insulation tape to the width of the nozzle block. Cut holes in the ceramic insulation tape for the bolt and the nozzle. The round hole on the right is for the nozzle because I wanted to ensure that the join in the tape would not be at or near the nozzle. 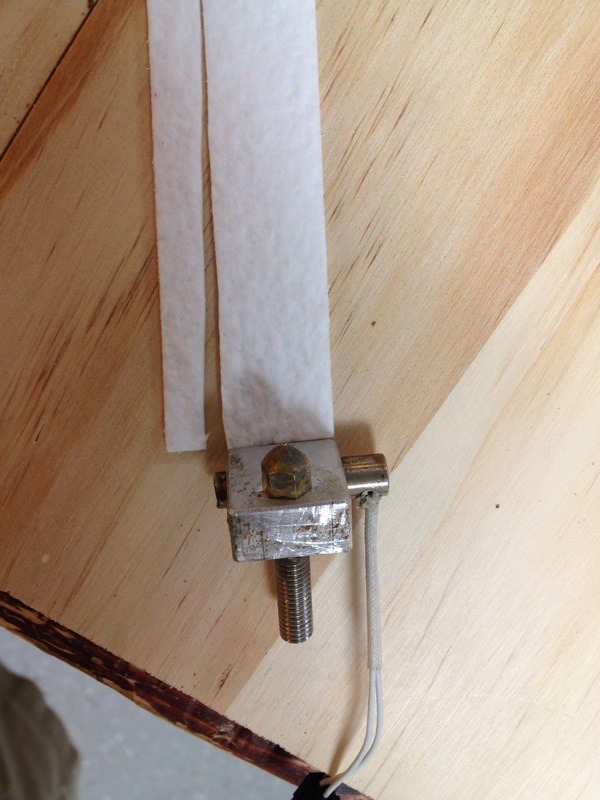 Wrap the tape around the nozzle block by putting the nozzle through one hole and the bolt through the other. Obviously, it works better to start by putting the tape over the long bolt and then wrapping around to the nozzle. Cut the end of the tape to fit the size of the block. 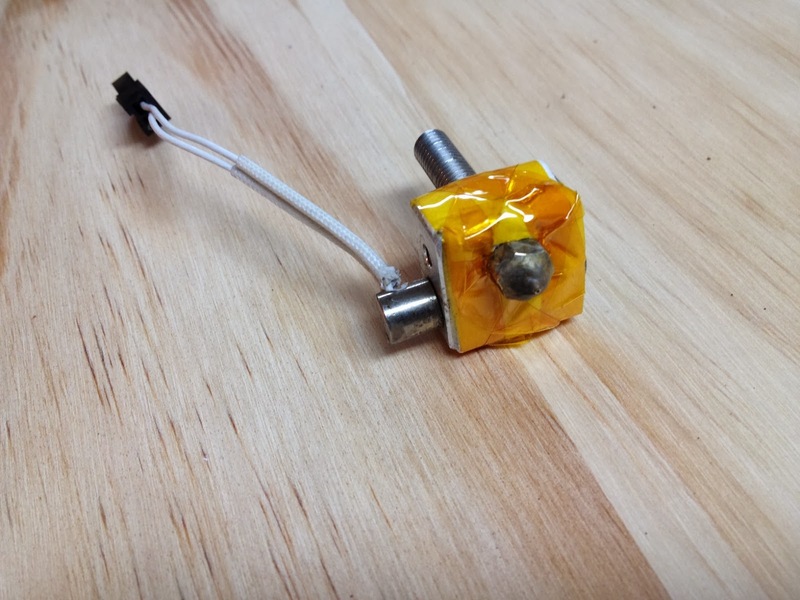 Wrap the nozzle block with kapton tape to hold the ceramic insulation tape in place. 1. 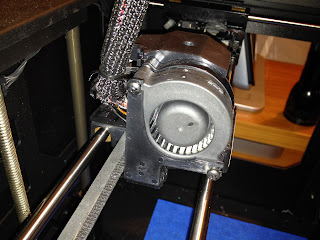 Make certain to align your nozzle block on the heat sink so it is straight (not crooked as shown below) and make sure that the screw holes are facing toward the nozzle (so you can screw them in from the bottom when you remount the unit). 2. 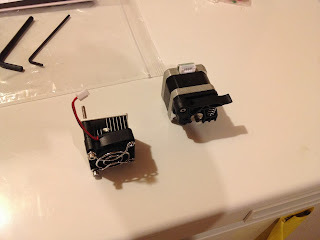 Next, and this is really very important, ensure that the bolt on the top of the nozzle block-heat sink unit (shown on the right in this picture) does not protrude above the top of the nut. 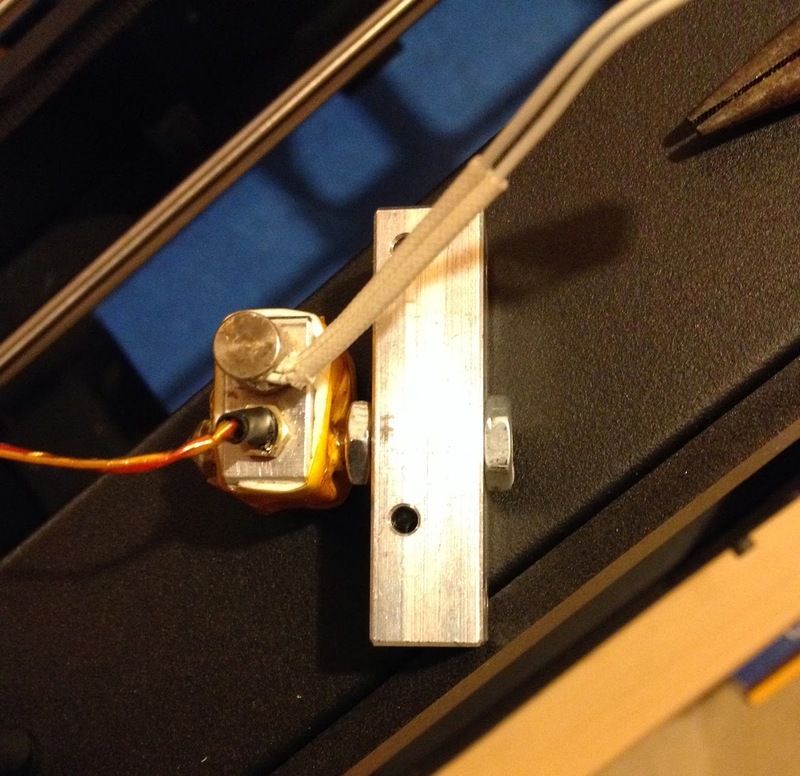 If it does, the extruder will not fit over top of it. This also seems to ensure that the nut in between the nozzle block and the heat sink does not compress the insulation. 3. Another minor gotcha occurs when remounting the side fan to the fan housing. The picture below shows where the two sets of black-and-white wires fit in a slot on the left side of the housing (toward the back of the Replicator 2). The picture shows me pushing the wires into the slot with my index finger. This will keep the wires from being kinked when the fan is screwed into place. Don't forget to level your build plate after the reassembly! This is critical because you may have changed the nozzle height, however slightly. Look under the Makerbot's Utilities menu for the "Level the build plate" option and follow the on screen directions. 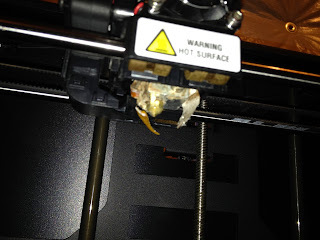 Next, load some filament and try a small test print. The "Mr. 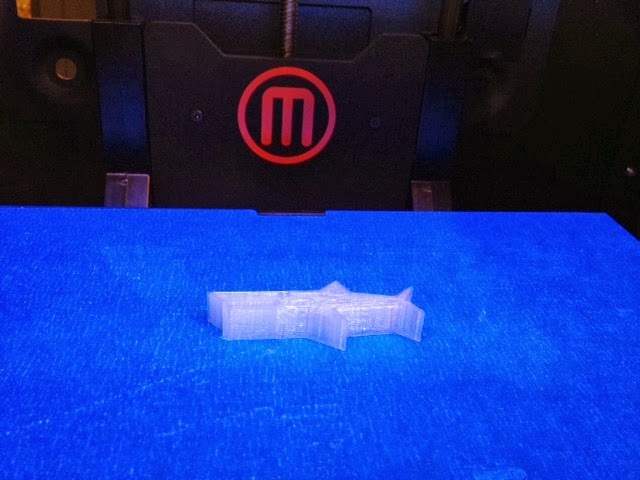 Jaws" model from the Makerbot's SD card printed flawlessly for me the first time. Yay! You might ask how long it took me to generate another filament ball. Less than an hour ;-) Fortunately, that one didn't tear my newly fixed insulation.